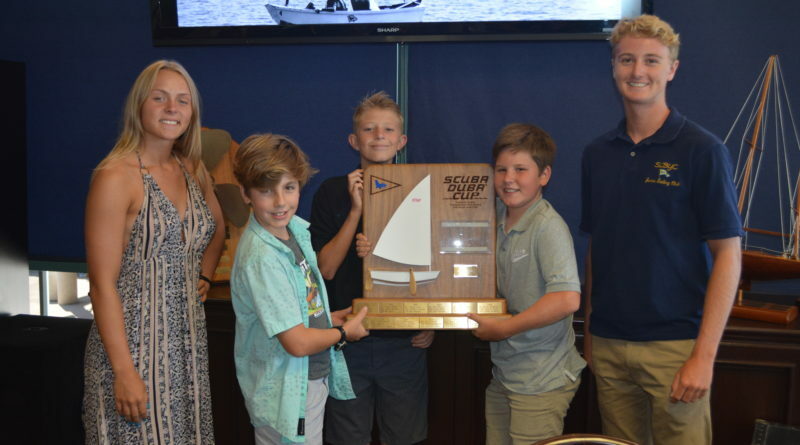 SEAL BEACH — The Seal Beach Yacht Club Sailing Foundation’s coaches Tristen Blackwell (far left) and Karl Panti (far right) presented the 2017 perpetual Scuba-Duba Cup trophy to Mason Conn, James Dunphy and Aiden Seitz at the foundation’s annual end-of-summer banquet. Dunphy finished in first place, followed by Conn in second and Seitz in third. Scuba Duba donated this award and has sponsored the race since 2001. The nonprofit organization provides youth sailors with an enriching, enjoyable and safe sailing experience. Seal Beach Yacht Club’s fall classes for juniors are held Sundays between Sept. 17 and Oct. 29. Email the club at sealbeachjrs@gmail.com for more information.